Ecuador has a variety of traditional dishes according to the area, region or culture. With this you will discover new flavors and sensations. On the second day, you will experience the “Six senses tour” consisting of more than 50 experiences. After arriving at Quito’s Mariscal Sucre Airport, our helpful guide will meet you. Moreover, it will serve as a translator, and assist with the private transfer to your hotel. After an early morning breakfast, the tour will depart to Quito downtown, or Centro Histórico, which was declared a UNESCO World Heritage Site in 1978. We will start with a panoramic view of Alameda Park and the Basilica, followed by a walk down the Seven Crosses street. The trip will continue with a walking tour, starting at Independence Square. From here, we will visit the presidential palace, the main cathedral, the gold-plated La Compañía Church, San Francisco Church and San Francisco Plaza. The trip starts with a drive to the Antisana volcano, the fourth in altitude in Ecuador, covered with glaciers and snow, and the surrounding Ecological Reserve. The climb and spectacular scenery on Antisana begins with close-up views of a massive glacial moraine, dating back to 11,000 year ago, jagged rocky peaks and a vast sweep of paramo vegetation above the tree line. In the morning after breakfast, we will head to The San Martín shrine, a 45-minute walk from town. The Zoo with a very important variety of animals will follow the tour. After visiting these two places we head to the cable cars where you can do canopy and even try some extreme activities. This day after breakfast we will bike and head to Puyo cycling through beautiful landscapes making and stop in the beautiful waterfalls of Baños. Once we are back in Baños we will take a short tour around the downtown. 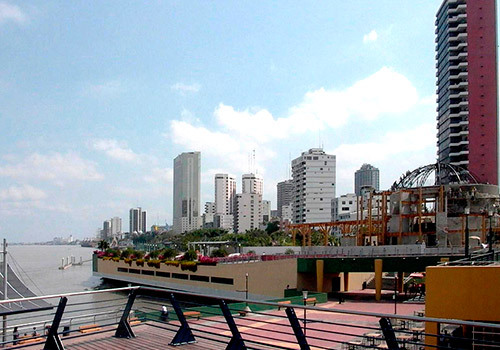 The city enjoys a pleasant subtropical zone climate. Later, we begin the route of waterfalls, including Agoyan, Heavens Door (Puertas del Cielo), Weddings Veil (Manto de la Novia), Devils Pan (Pailón del Diablo), and Machay. Today you will spend the day exploring the beautiful landscapes of the area. In the Chimborazo province around Abraspungo, there are many trails perfect for hiking and expeditions through various ecosystems such as paramos, lakes, mountains and Andean forests. Chimborazo, (6,310 meters/20.697 feet above sea level) is Ecuador’s highest mountain. Its name comes from Quechua: Chimborazo, razo,rasu = snow and chimbo probably from chimbana = to cross, since three snow covered passes surround the mountain. Lush endemic flora and fauna of the area can be observed, including: one of the most representative species is the Chuquiragua (also known as the mountaineer’s flower) llamas, birds as well as experience the unique environment of the Andean paramo. After breakfast, we will depart from Riobamba on the Nariz Del Diablo train ride. This train ride is the most famous in Ecuador. It is a journey between Riobamba and Alausi and is the most sought after tourist attraction in the country. Known as “the most difficult railway in the world” They got around the problem by carving zigzags out of the rock allowing the train to climb the ascent. The train ride offers spectacular views of the Ecuadorian landscape. On clear days, you will be lucky to see Chimborazo volcano. After that we will visit Ingapirca. They are located in the province of Cañar, about an hour and 45 minutes from Cuenca. You will be taken on a guided tour. The vast archeological complex includes a roofless fortification, courtyards, terraces, temples, houses and a ´castle’ possibly the Temple of the Sun. Plus, to enhance knowledge a museum is now open at the site, with both archeological and ethnographic displays. Cuenca is Ecuador’s third largest city, yet it retains its pleasant provincial air. Its red tiled roofs, cobblestone streets, flowery plazas and museums make it very special. Today we will enjoy a full day city tour to discover, at a leisurely pace, the beauty and charm for which Cuenca has been recognized as a World Cultural Heritage Site. This is a walking tour in the colonial downtown area of Cuenca, you will have the opportunity to enjoy the warmth and hospitality of its people, the colorful parks and plazas, religious monuments and handcraft shops, plus an explanation of Cuenca’s history. In the parish Baths, located 8 miles from Cuenca, the thermal water coming out of a geological fault called Loma de los Hervideros is used by the inns and spas for treatment of some diseases associated with airway tract. The fault line is 400 meters long and 10 meters high. The water emerges at a temperature of 75 ° C. Due to these conditions, the thermal waters are attributed healing properties for rheumatism, anemia, stress, acne, gastritis, kidney bile and anxiety. In the Thermal Spa there called thermal pools, in which users experience different temperature changes. For example, at first the water is 41 ° C and in the second thermal bath temperature of 8 ° C, this contrast helps the blood circulation throughout the body. Just after breakfast, the tour will depart, heading northwest towards Cajas National Park. After a short drive, we will arrive at Cajas National Park where we will be able to take part in different activities such as hiking, fishing, bird watching, viewing flora and fauna, and more. We can visit the Interpretation Center placed in La Toreadora Lake (the biggest and the most important in the whole complex). Here we will see pictures and presentations of the park. This morning we will visit the town of Vilcabamba, a very beautiful town heading the Province of Loja.With a name that means “Sacred Valley” in the language of the Incas, this haven was where the Inca rulers retreated for rejuvenation and renewal. Today Vilcabamba Ecuador still claims to possess healing qualities and conditions that make it conducive to well-being and long-life. In fact, its modern-day nicknames include aliases such as the “Valley of Longevity.” Whether or not these claims are true, there’s no question that this hidden gem is an ideal destination for expats who are seeking a retreat that will nurture their bodies, minds, and souls. After a short visit of the town we will do a short hike of “Cerro Mandango” which is believed to be a sacred place. Today we head to Podocarpus National Park: Tucked in a corner of southern Ecuador near the Peruvian border and spanning 360,000 acres, Podocarpus National Park includes cloud forests, high-altitude grasslands, and a series of small Andean lakes. Huge swaths of exposed volcanic rock face stand out among steep, green mountainsides. Not only is Podocarpus important for protecting biological diversity, but it is also critical for the more than one million people who draw their water from four rivers with headwaters in the park. The Podocarpus National Park;s area has one of the largest concentrations of bird species in Ecuador, with more than 500 registered species, although some experts believe that number could be as high as 800. Some of the most threatened birds in Ecuador have healthy populations in and around the park, such as coppery-chested jacamar, bearded guan, Equatorial graytail and Peruvian antpitta. More than 40 mammal species inhabit the area, including the jaguar, wooly tapir, Andean bear, pudú (the smallest deer in the world), giant armadillo and Neotropical otter. Today will be your transfer out to the airport to take your flight back home.